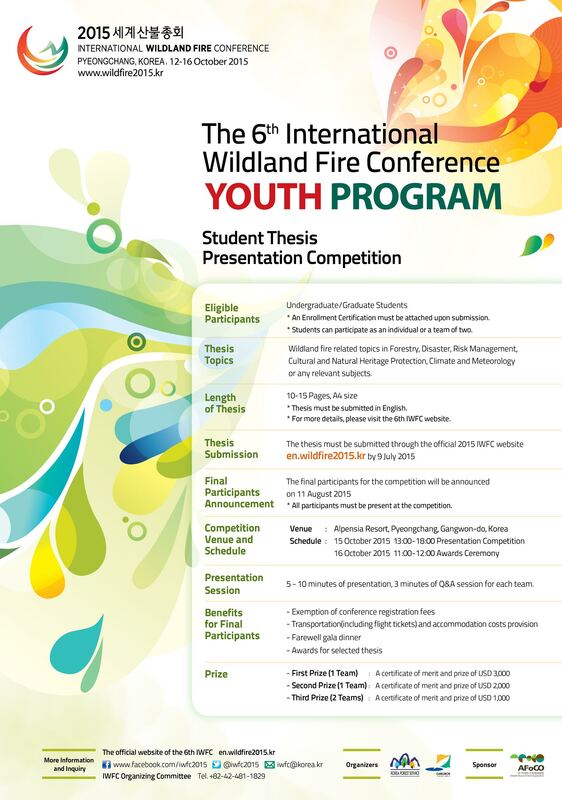 IFSA’s International Processes Commission has made collaborative connections with the Korean Forest Service, and is excited to announce the opportunity for undergraduate and graduate students to participate in the newly-launched Youth Program for the International Wildland Fire Conference (IWFC), to take place from the 12-16 October, 2015. Basically, this is a call for thesis submissions on wildland fire related topics in forestry, disaster and risk management, cultural and natural heritage protection, climate and meteorology, and any other relevant subjects. Selected thesis presentations will have all expenses paid to attend the conference in Korea! Additionally, there are 1st, 2nd, and 3rd place prizes (of $3,000, $2,000, and $1,000 USD respectively) for the best submissions! Deadline is 9th July, 2015.